The Quest for the Holy Grail has begun. 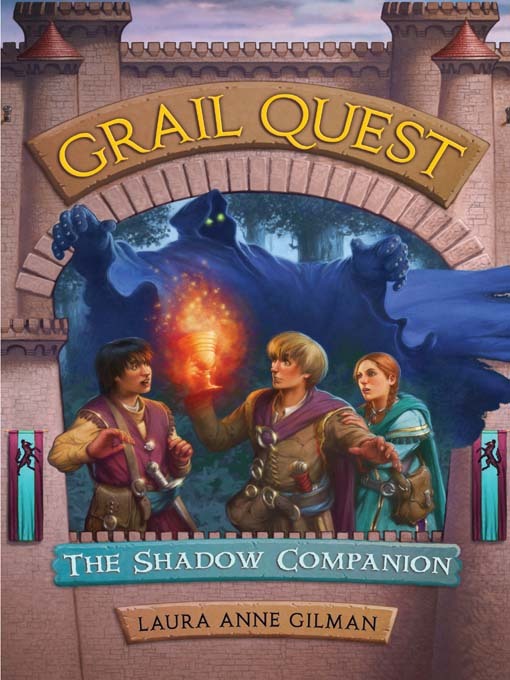 Three teenagers, Gerard, Ailis, and Newt, have earned a place on the Quest alongside the Knights of the Round Table. But they are not the only ones seeking this treasured cup. King Arthur's sinister half sister, Morgain le Fay, wants the Grail for herself. To make sure she doesn't fail, she has summoned help from someone more evil and powerful than she--the Shadow Companion. But what Morgain doesn't know is that the Shadow Companion has come with a secret agenda. Now it is more important than ever for Gerard, Ailis, and Newt to recover the Holy Grail . . . before a dark power gets it first. "You have the manners of a crow and the voice of a cockerel, wrapped in the body of a mewling coward." "And you, sir, are white-necked, flower-hearted, and weak-kneed." The two men glared at each other, hovering near their swords. "Hold!" A strong, masculine voice rang out under the arched stone roof, echoing impressively. Sir Matthias was older than many of the knights on the Quest, but he had a pair of lungs that had lost nothing over the years, and he knew how to project his deep voice over an entire battlefield. Filling the hall of a relatively small monastery was no difficulty at all. Even the carvings of saints in niches on the wall seemed to stiffen and stand a little straighter at Matthias's bellow. The two knights who had been exchanging insults did likewise, but did not back down completely. Soon after leaving Camelot, it had become evident that the group of forty-seven knights and squires was simply too large to move smoothly on such a far-ranging quest. Squabbles had broken out over whose tent was placed where, or whose squire did which group chores. Within days, factions began to form within the band of knights — even among those who should have known better. Sir Matthias, whom Arthur had assigned to oversee the Quest, came to a rapid decision: to break the Quest down into four smaller, more mobile groups, and send each off in a different direction, under a trusted and sensible lieutenant. He thought that would make the knights in each group focus on what they were meant to be doing. It hadn't quite worked that way. Sir William glared at Sir Bart. The gaggle of monks backed away from the two men, looking to Sir Matthias for help in keeping violence out of their sacred halls. "Take it outside!" he ordered his knights, then turned to make an apology to the abbot without waiting to see if his command was obeyed. "We gave you hospitality for the nature of your Quest," the religious man said, his cowl pushed back as he spoke to Sir Matthias. "And this is how you repay it, by bringing discord into a house of the Lord?" The rumor that the Grail had once rested in the stone chapel of this monastery on the fog-shrouded coastline had brought Sir Matthias's group westward. But there — as in so many places before — the rumor had faded into ancient mist. The monks did have a story of a man dressed in strange clothing, who had come to the chapel when it was new-built. He stayed the night. But other than a shred of white fabric that might once have been an Apostle's robe — or the hem of some kitchen maid's apron — they had nothing to show for it. The disappointment had pushed several of the knights into squabbling about their worthiness, suggesting that various sins — real or imagined — were the reason why their group had not yet discovered any trace of the Grail's whereabouts. It was at this point that Sir Matthias had stepped in. "I apologize, good Father. We shall remove ourselves at once, and leave you to your prayers and contemplations." The abbot looked sternly at Sir Matthias. "You are men of sword and blood, seeking a thing beyond your ken. Not even the High King has the right of ownership of the Grail. It is a thing of faith, of a greater glory than that of this mortal world. Remember that, and perhaps your own faith will be rewarded." Gerard, standing at Matthias's left side, had a fleeting thought that he would like to set this abbot against Merlin when the enchanter was at his most obtuse, and see who cried for mercy first. He kept that thought to himself, however. Newt and Ailis would have appreciated it. But Newt and Ailis were not with him. Laura Anne Gilman is an editor and writer who has spent years reading and thinking about the tales of Camelot. She has authored a number of novels for young readers, including two Buffy the Vampire Slayer books. Gilman has been an editor for several years, and is currently the Executive Editor of ROC Books, an imprint of Penguin.